The Citation X is the fastest of the Cessna business jet line, and with its inception brought new standards in luxury air charter speed. And as for luxury, it is all you can expect with an aircraft that boasts Rolls-Royce turbofan engines mounted high on the rear fuselage. As with other luxury air charter models we offer and love, the Citation X features no less than 7 windows per side in its spacious cabin. The interior feels decidedly luxurious, with ample space to mill about and stretch. Passenger capacity is approximately 12, and a flight crew of two. 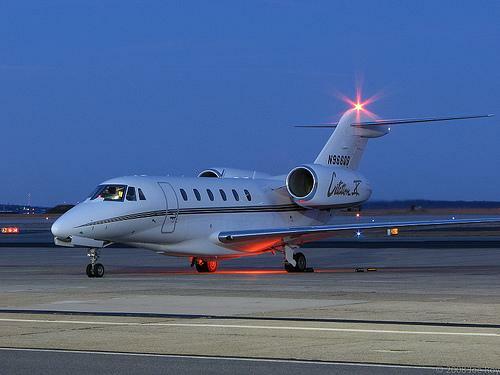 The cabin is a robust 24 feet long, and each Cessna Citation X interior is designed according to the specifications of the owner, so no two are identical. The cruising speed for this Cessna is approximately 521 knots, with a long range of around 3,400 nautical miles. The Citation X charter can climb up to 43,000 feet in transit, within just 30 minutes of takeoff, ensuring that you will reach your destination in a timely and luxurious fashion. In fact, this aircraft is certified to travel at altitudes of 51,000 feet, where air traffic is nonexistent and fuel efficiency is optimized.